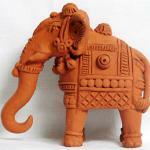 India is a country having a rich heritage of art and craft from time immemorial. For centuries, its creations have fascinated the world. Even today the art and crafts pull hundreds of tourists annually. Exquisite workmanship converts the easily available raw materials into products of high aesthetic ad functional values. The types and designs are influenced by religious, political and social factors thereby giving rise to diversified products governed by the traditional, ritual, geographical and climatic conditions and cultures. From Kashmir to Kanyaumari and Gujarat to Assam, the diversity has to be seen to believe. Every region has its own specialties. Places like Rajasthan, Bengal and Orissa demands special mention on the 'Art map' of the world. Gems, marble and tie-dye from the west, filigree, cane & bamboo and paintings from the east draws buyer from every corner of the globe. Its creations can be seen in architecture, sculpture, painting, jewelry, pottery, textile, papier mache and wood.